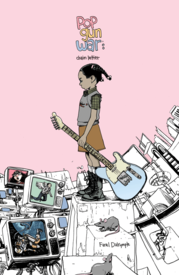 Farel Dalrymple caught a lot of eyes and turned plenty of heads with his creation of Pop Gun War, roughly a decade and a half ago. Now, he's back with a follow up volume that we had all but given up hoping for. Rendered in a complex, multi-faceted fashion that combines the classic black & white, pen & ink work of the original Pop Gun War with the lush-but-subdued painterly style he developed for Wrenchies, and then sews it all together with several intermediary approaches to the comics page. Don't miss it!